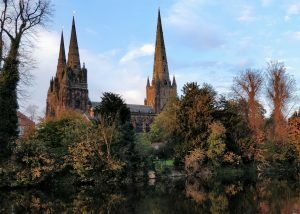 As part of this year’s Selwyn Lecture in Lichfield Cathedral I was asked to reflect briefly on how vocation is addressed to all creation. And that’s an interesting question, isn’t it? Does creation have a vocation? I think that for many of us, vocation carries a sense of “doing what we are meant to be doing” doing what we are made to be doing. There’s a sense, perhaps, of fulfilling God’s plans for us. In the seventh century the great monastic writer Maximus the Confessor wrote about how the universe was created out of nothing by God. And if the universe was created out of nothing by God then everything that is somehow comes from God. And if everything that is somehow comes from God then everything contains some imprint, some essence, of the Creator’s intention within it. However – Maximus says – this essence, or intention, of a creature can be obscured (not distorted, but obscured) by its way of living in the world. Think perhaps of a battery hen, or a bramble-choked sapling. As we know, sometimes all too well, having a vocation doesn’t necessarily mean living out that vocation. It is only when that divine intention and the way of living in the world are aligned that a creature can truly flourish in its vocation. There is a large oak tree which presides over our garden. They say that a single oak sustains a thousand species – I haven’t counted, but I know that she provides a safe space for squirrels and crows, ivy and ferns, tawny owls, children and countless insects. That old oak no doubt grew from one of thousands upon thousands of acorns to fall onto the soil and is now flourishing in her vocation. ‘A tree gives glory to God by being a tree. For in being what God means it to be it is obeying him. It “consents,” so to speak, to God’s creative love. It is expressing an idea which is in God and which is not distinct from the essence of God, and therefore a tree imitates God by being a tree. “What I do is me” Another beautiful description of living out a vocation, all the more powerful in the context of a poem about birds and insects and rocks. Vocation is woven throughout God’s creation, like the life-giving roots in a moss-covered bank, but what does this mean for us? We are not separate from the rest of creation. We don’t live in our own little spiritual sphere a step removed from the world around us. And just as our vocation – and our ability to live out that vocation – is shaped and nurtured by the actions of those around us, so the vocation of all creation is shaped and nurtured, and too often set back by our actions. Right at the beginning of the story of God’s people we find humans placed in a garden. To tend and to till, to grow and to gather, to nurture and to name. That is the human vocation, the vocation of each and every one of us – to work with God for the flourishing in vocation of all creation, human and non-human. We don’t always get it right – as Hopkins puts it, “even when we mean to mend her we end her”. But a vocation is never something you do, it’s not a task to be completed or a job to be done, it’s about who you are, who we are. A tree gives glory to God by being a tree. A squirrel gives glory to God by being a squirrel. And humans – sons of the soil, daughters of the dust – we give glory to God by becoming more fully ourselves, so that (to use the language of St Francis) brother Sun and sister Moon, brother Worm and sister Sparrow, brother Hawthorn and sister Oak might flourish in their God-given vocation. Rev. Rich Clarkson is Rector of five rural parishes in North Shropshire. He has degrees in Physics and Theology and recently completed his Master’s dissertation on Nature Contemplation in the writing of Maximus the Confessor. He is a member of the Lichfield Diocese Environmental Group, a JRI associate – and dad to three wild boys!